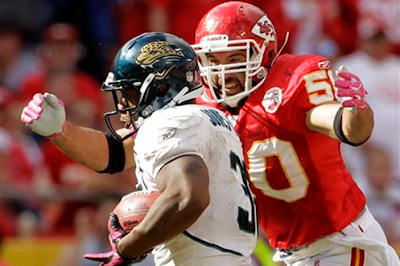 Kansas City Chiefs linebacker Mike Vrabel announced his retirement from the NFL on Monday after 14 seasons. He said he has accepted the position of linebackers coach on Luke Fickell's Ohio State coaching staff and will be introduced at a news conference later Monday. "I am extremely appreciative of the teammates, coaches, and great fans who surrounded me during my NFL career, and am honored to have been a part of three tremendous organizations in the Pittsburgh Steelers, New England Patriots, and Kansas City Chiefs," he said in a statement. "I am especially grateful to Bill Belichick and Scott Pioli, who not only gave me the opportunity to play for a team that won three Super Bowl championships and an NFL record 21 games in a row, but also taught me invaluable lessons on creating the ultimate team approach." Vrabel, an Ohio State alum, played the past two seasons with the Chiefs after eight years with the Patriots. He has been part of the NFL's labor negotiations as a member of the players' association's executive committee. Fickell, the Buckeyes' former defensive coordinator and linebackers coach, was promoted to head coach on May 30 after Jim Tressel resigned. Fickell and Vrabel were roommates during their time together at Ohio State. "I am very excited to become a part of Luke Fickell's staff at Ohio State. I have great faith and trust in Luke leading the Buckeye football team as he represents all the core values integral for a program's success, and I am looking forward to working with our student-athletes as I begin the next phase of my career," Vrabel said in the statement. Fickell, in turn, said he was excited to add Vrabel to his staff. "Mike will bring passion and a competitive nature to everything we do, and I am really pleased to announce his addition to our coaching staff," Fickell said in a statement released by the university. "I am excited about what Mike brings to the program in terms of football knowledge and also in terms of what it means to be a Buckeye. He is what every one of our young men desire to be: a great student, player, husband and father!" At Ohio State, the 35-year-old Vrabel was a two-time Big Ten Defensive Player of the Year Award recipient before being drafted in the third round of the 1997 draft by the Steelers. He signed with New England before the 2001 season and won three Super Bowls as a member of the Patriots. He was acquired by the Chiefs with Matt Cassel for a second-round pick from New England on the first day former Patriots' executive Pioli could make a move as general manager of the Chiefs in 2009. In 206 career NFL games, Vrabel has 742 tackles and 57 sacks. He was named to the AFC Pro Bowl squad in 2007. He also had 10 receiving touchdowns and became known as a goal-line scoring threat during his career. That included the playoffs as he had two touchdown receptions in his postseason career with the Patriots, catching short scoring strikes from Tom Brady in Super Bowl victories against the Carolina Panthers and Philadelphia Eagles. Belichick gave Vrabel high praise in the statement released by Ohio State. "During his Patriots career, there was no player more respected for his football intellect and revered for his leadership by his teammates than Mike," Belichick said in the statement. "He was elected a team captain by his peers and is a player who I think everyone knew was destined to become a coach after his NFL playing career was over.